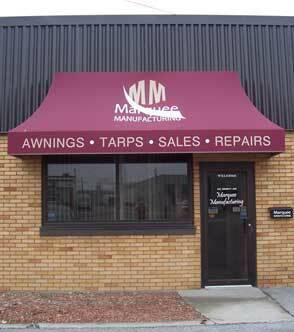 Marquee Manufacturing is a wholesale supplier to the Awning and Sign industry. We manufacture and wholesale. Retail enquiries are welcome. • Single or double sided Sign Boxes with or without Plastic faces. (These boxes can be built using the E.X. System or either of the Sign Pro or Sign Comp. Extrusions). We have over 30 years of experience in both the Awning and Sign trade. Our staff is both experienced and capable of handling all of your Awning and Sign needs. We work only with the highest quality materials, and our staff takes pride in providing quality workmanship on every job! For a same day quote please Call, Fax or Email us. Ask for Mike Gallant or Beau Gallant. We will provide you with a very competitive quote using the highest Quality Standards available to us.